A visit to our Bike Shop prompts a surprise memory! 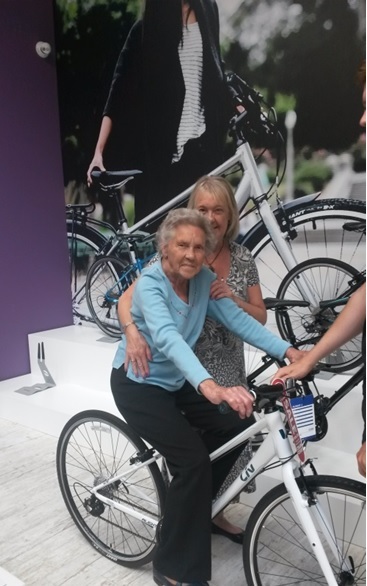 A recent visit to our Giant Bike Shop by Jan Poole and her mum, Joan, prompted some old memories to be recalled. We wanted to share that very special experience with you here, through Jans own words. ‘I brought my 85 yr old mother (Joan Rhodes nee Fieldsend) to the Bike Shop as a bit of a treat, as she used to be a racing cyclist when she was younger. The staff were wonderful and made a big fuss of her, she has dementia now so I’m trying to help her make new memories and remember old ones. Thank you so much for making her visit so memorable, she tells everyone she sees, although each time she recounts the tale it changes slightly! I thought you might like this photo of her with her family after cycling to their holiday destination (Derbyshire to Skegness) probably early 1940’s, Joan is on the left, unfortunately at the moment I can not find one of her when she was racing, but I’ve also attached the photo taken on the day when she was on one of your bikes. She says it was the best day trip ever and she remembers her Claude Butler bike to this day’. We hope that we can welcome you back again soon for another visit!